Notably, sandwich cake is not the same as cake sandwich. For mysterious and unknown reasons, a certain roommate of mine does not really like normal cake. (I know. This is what I have to live with.) Luckily, we do share an enthusiasm for bread and a distinct lack of enthusiasm for raucous birthday revelry. 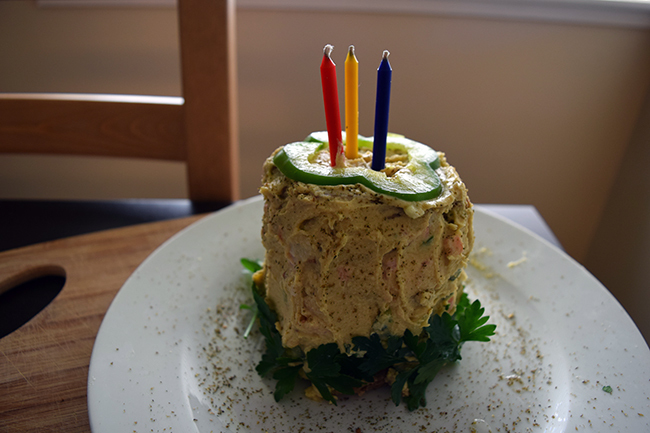 So, I decided to commemorate his birthday with a silly little “cake” made of bread and sandwich-esque fillings, frosted with hummus, dusted with za’atar. 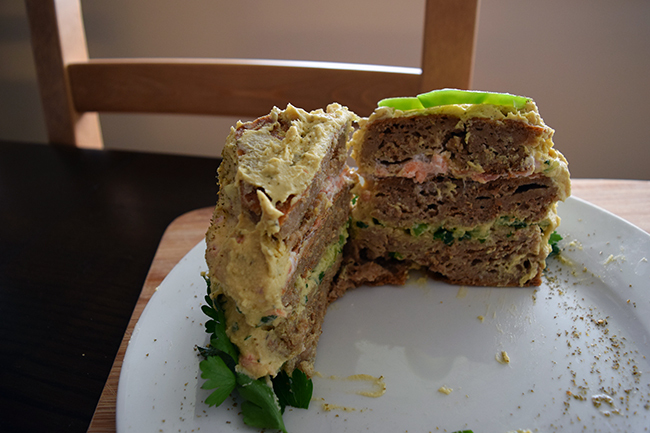 It tastes like a veggie sandwich, albeit a messy one. 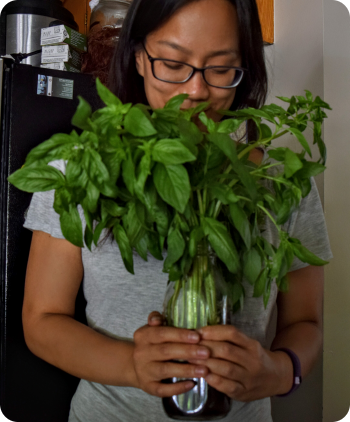 With vegetable garnishes and some nostalgic candles, it could masquerade as a cake from afar (it’d have to be pretty far, though). I used my slightly fussy recipe for the smoothest, stickiest hummus I know how to make, some spongey and hearty whole wheat sourdough, and chopped peppers and lox for the layers. 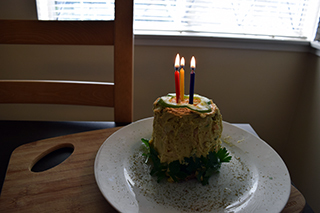 Frosting a cake is not my strong suit to start with, and, well, hummus doesn’t make it any easier, so sandwich cake might come out a little “rustic” looking. It’s okay. Points for originality and effort more than make up for it. And, yes, sandwich cake is darling and silly and all, but I say next time we conquer the cake sandwich! Cook the chickpeas with a pinch of baking soda and a generous pinch of salt until they are soft. The baking soda helps to break down the skins of the beans, which gives you a whisper-smooth hummus without the pain of individually “peeling” the beans. I’m crazy, but I don’t want you to have to individually pop chickpeas out of their shells, especially if you eat as much hummus as I do. Note — I cook my beans in the pressure cooker, which is a lot faster. I set it for 13 minutes under high pressure with the baking soda, salt, and a small drizzle of oil, which works like a charm. This is a great use for the pressure cooker, since it’s a recipe that forgives if the beans are overcooked a bit. Drain the chickpeas and let cool slightly. Use a food processor or high-power blender to blend warm chickpeas, garlic, olive oil, tahini, and lemon juice. Add salt and pepper in stages to taste. Serve immediately if possible, arranging a well in the middle and pouring additional olive oil in. Optionally, sprinkle with za’atar. … or you could frost a “cake” with it. For optimal frosting texture, do not add the additional olive oil. Carefully cut 3 circles from the loaf of sourdough, roughly 3″ in diameter. Trim so they are as flat and uniform as possible, making sure that each piece has at maximum one side that’s crust (so at least one spongey/soft side). Wrap in plastic wrap and refrigerate while you prep the other ingredients. 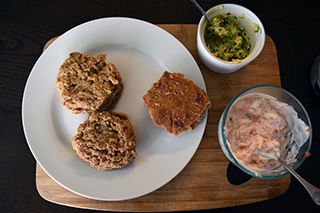 Mince the lox, combining with greek yogurt or cream cheese, adding additional salt and pepper if desired. Mince the bell pepper (or cucumber, or whatever) and combine with 1/4 cup of the hummus. Assemble the “cake” by placing one layer, crust down, then arranging the hummus and vegetable mixture on top. It should stick fairly well to the spongey side. Carefully place another piece of bread on top. This middle layer will ideally have 2 spongey sides, but if it has a crust side, face the crust side down. Push down gently to adhere. Arrange the lox mixture on top carefully. Carefully place last piece of bread on top, spongey side down. Gently press down to adhere. Using the remaining hummus, carefully (but confidently!) “frost” the cake. I started with a big dollop on the top and then did the sides in sections, but to be honest, I’m pretty crap at frosting even normal cakes. Just slather it on, and if pieces of filling poke out, pretend like it’s on purpose. Decorate with green herbs, extra vegetables, etc, and sprinkle with za’atar to finish. Top with candles (you might need to use some force to poke them through the crust), and celebrate!